When I first saw Restaurant in a thrift store I didn’t really know what to think. I honestly had never heard of the game before. That is not particularly surprising as the game was never reprinted and it was made by a publisher that is no longer in business. Even though I had never heard of the game, I was intrigued because the theme actually interested me. While there have been other restaurant themed board games, it is not a theme you see a lot. That is kind of surprising as the restaurant theme creates so many opportunities for interesting board game mechanics. 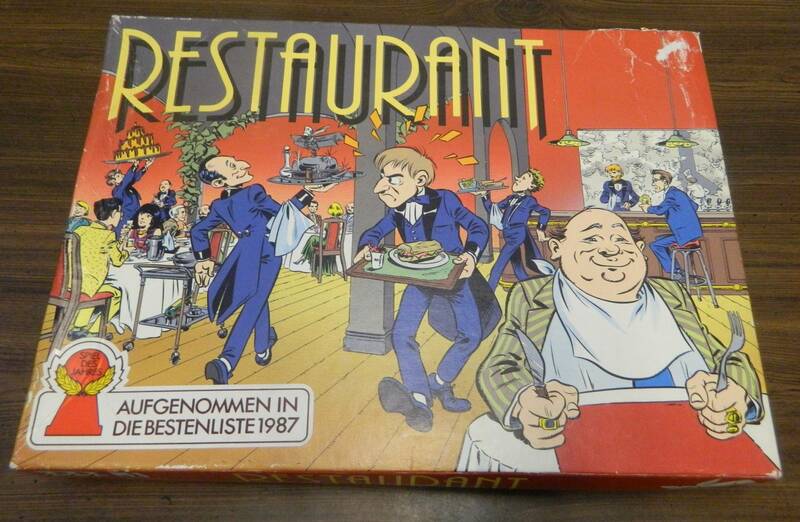 What put me over the top though was the sticker in the bottom left corner stating that Restaurant was one of the recommended games for the Spiel Des Jahres award in 1987. While the game was only recommended (basically one of the runner ups), there had to be something about the game which put it in the running for the Spiel Des Jahres. Restaurant has a lot of interesting ideas which create a unique experience that ultimately doesn’t work as well as it could have due to luck and some mechanics not working as intended. Each player chooses a color and takes all of the pieces of that color. Shuffle the cards. 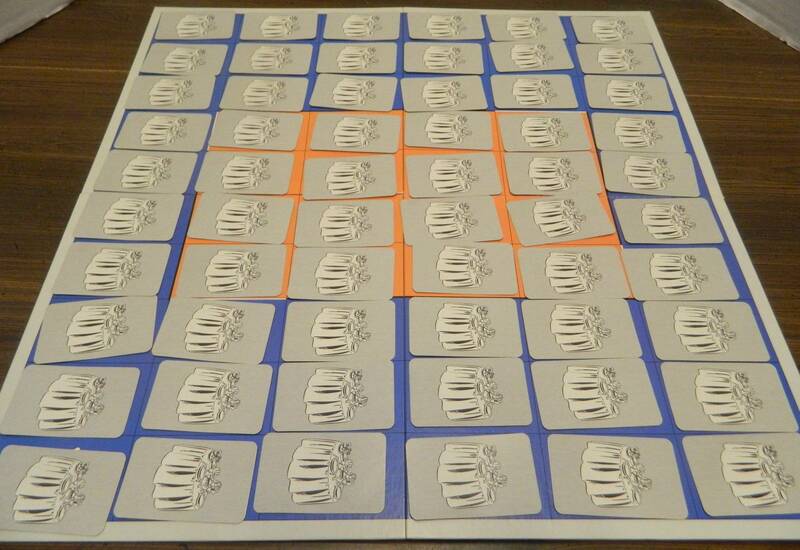 Place one card face down on each space of the game board. Choose who will start the game. Restaurant is played over two different phases. In the first phase the players will take orders and in the second phase they will deliver the orders. The player who is starting the game will choose one of the cards along the edge of the board. They will remove the card from the board and replace it with one of their colored pieces. The player looks at the card. 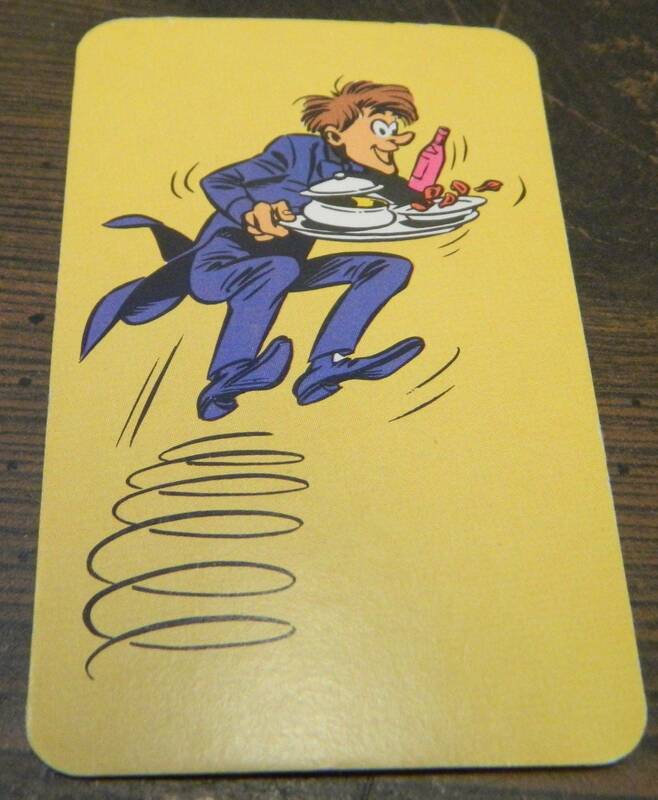 If the card is not a meal card (see below), the player shows the card to the other players so the appropriate special action is taken. After any special action is taken, the card is added to the player’s hand. Play then passes to the next player clockwise. All players will begin their turn by taking a card from a table next to the card that was taken by the previous player. They may take a card from any adjoining table that is horizontally or vertically (not diagonally) next to the previously chosen table. 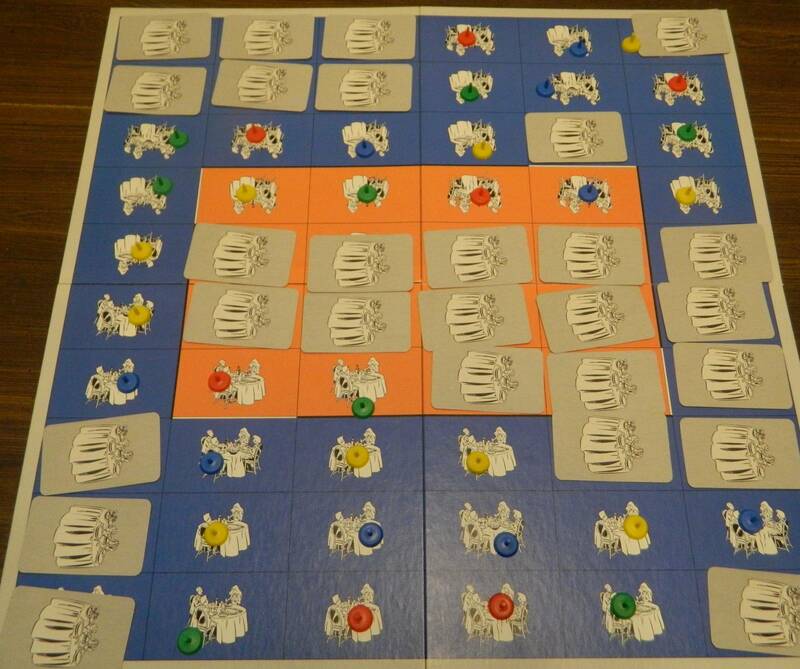 The blue player has chosen the space indicated by their colored piece. They take the corresponding card and add it to their hand. The next player can either take the card above, below, or to the left of the space claimed by the blue player. The first phase continues until either all of the cards have been taken or the players have reached an area where there are no adjoining tables that still have a card. The first round can’t end until at least 30 cards have been taken. The players have reached a dead end so the first phase has ended. Before the second phase begins, players will count up the values of their meal and reserved meal cards. The players will score points equal to the total of all of their meal cards. The player who scored the least amount of points will start the second phase. All cards still on the game board are returned to the box. 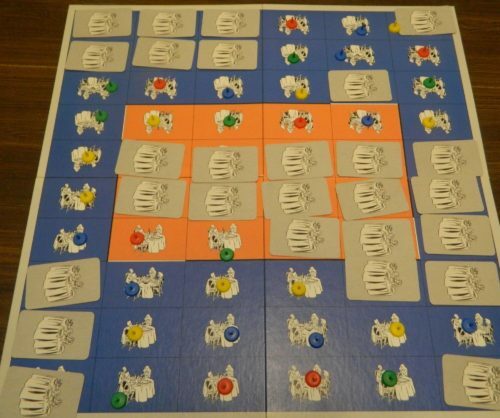 The second phase of the game begins with the player who scored the least points in the previous round, choosing one of the tables with a marker on it on the outer edge of the board. They will place one of the cards from their hand face up on the space. The next player will then place a card on one of the neighboring tables (not diagonal) that have a piece on it. 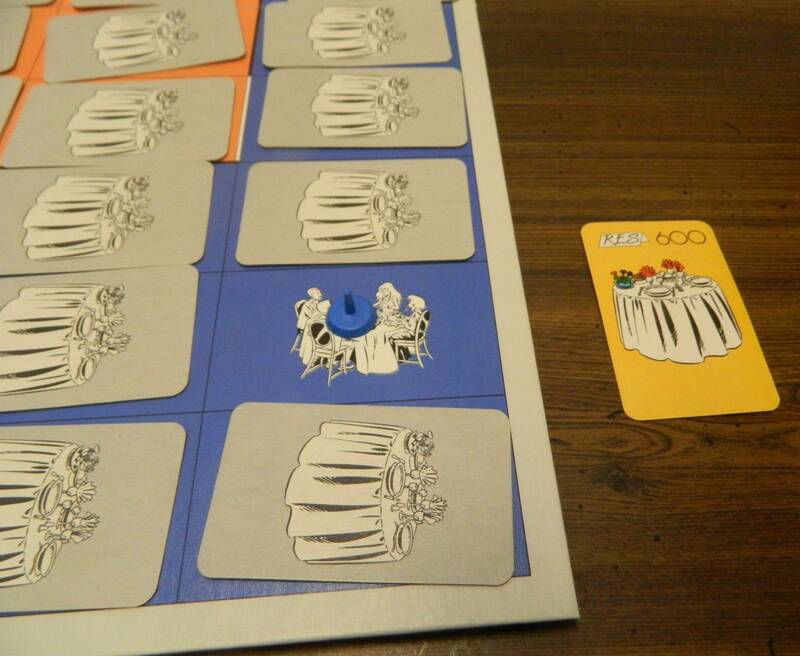 The blue player has started the second phase by placing a 300 meal card under the table they control. The next player will have to play a card under the table with the yellow piece even if they are not the yellow player. They have to play a card to this table as that is the only neighboring table that was claimed in the first phase. 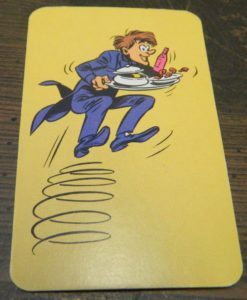 Dish of the day, double stroke, jump cards, and meal cards worth 300 points can be played on any table. Meals that are worth 600 points can only be placed on the tables in the center of the board (orange background). 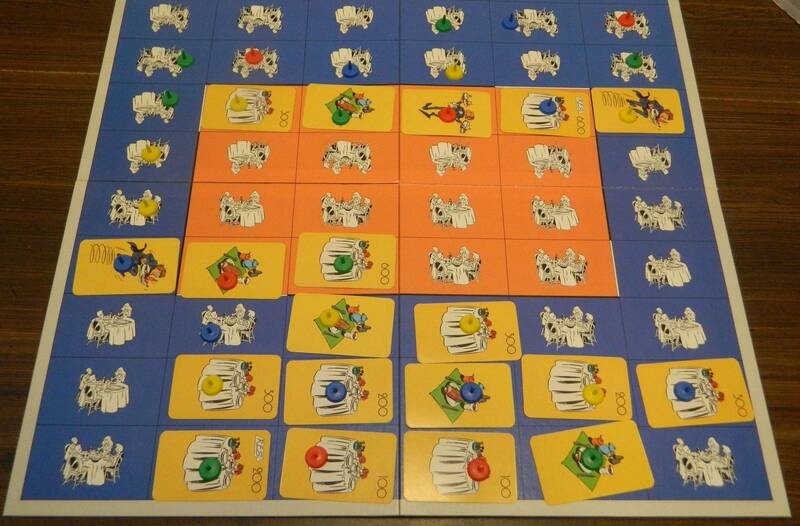 Meals worth 100 or 200 points can only be played on tables on the outside of the board (blue background). If a player is unable to legally play a card, they will lose their turn. The second phase of the game can end in one of two ways. The game ends immediately if a player plays their last card. The game can also end if the players reach a dead end and there are no neighboring tables with a piece on them that don’t already have a card. 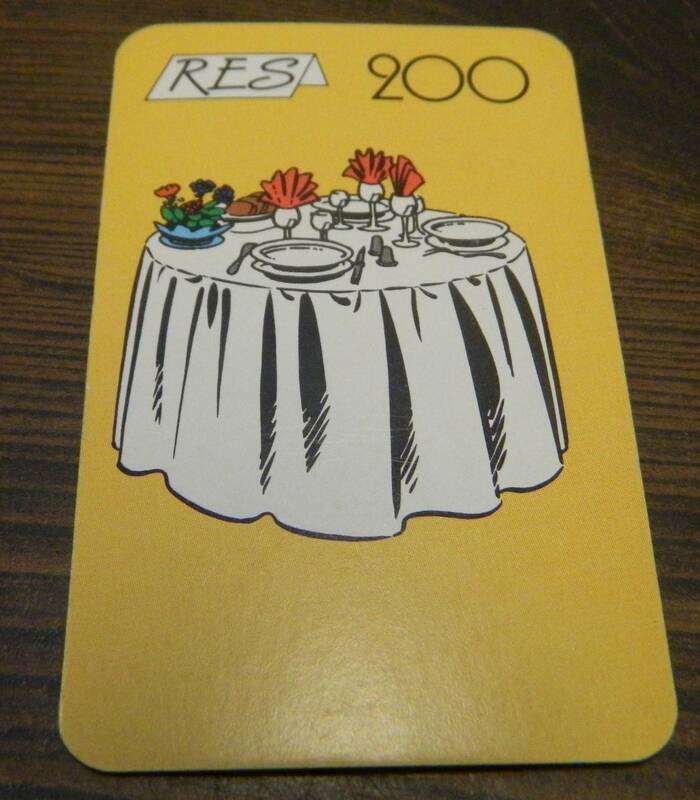 The last card played was the RES 200 card in the bottom left corner. As there is nowhere for the next player to play a card, the second phase ends. Each type of card in the game can be used in both the first and second phase of the game. Some of the cards have different actions for the first and second phase of the game though. Dish of the Day: In the first round the dish of the day cards are worthless. Whenever a player draws a dish of the day card they can immediately exchange it for a card from one of the other players. The player chooses who they would like to trade with. They will randomly take a card from that player’s hand and exchange it for the dish of the day card they just drew. In the second phase of the game, all Dish of the Day cards are worth zero points. Double Stroke: When a player draws a double stroke card, they will add the card to their hand. They will then get to immediately take another turn. This applies to both the first and second phase of the game. Jump: When a player takes a jump card, they will add the card to their hand. They will immediately get to take another turn. Instead of having to remove/place a card on an adjacent space, a jump card lets the player choose any unoccupied space on the board. This applies to both the first and second phase of the game. Meal: In the first phase the meal cards count for points for the player who draws them. Each meal card is worth the value shown in the top right corner. 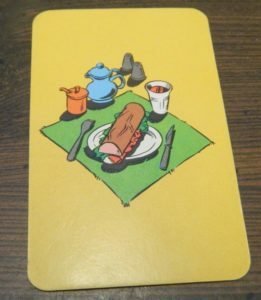 In the second phase of the game, meal cards are worth their value to the player who controls the space that they are played on. 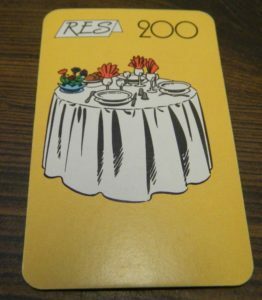 Reserved Meal: Reserved meal cards look like meal cards except they have the letters “RES” on the card. In the first phase reserved meal cards are worth the value printed on the card. 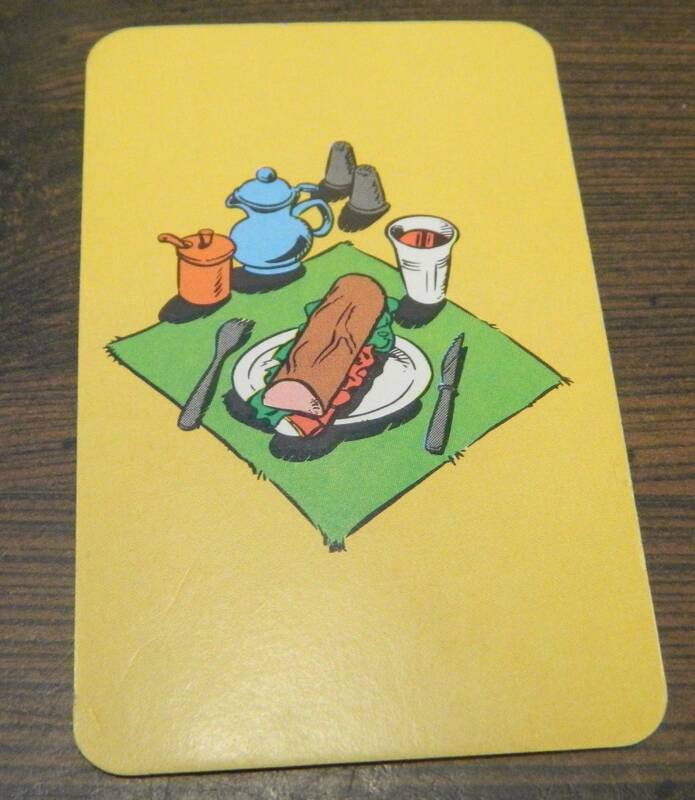 A reserved card also allows a player to set aside all of the meal cards they have acquired so far. This prevents these cards from being taken due to a dish of the day card. In the second phase reserved meal cards are worth their value to the player who controls the space they are played on. They are also worth double negative points if a player is unable to play them before the end of the game. When the game ends, players will add up the points they scored in the second phase. Players will score points for the cards placed on the tables that have their colored pieces. All dish of the day, double stroke and jump cards are worthless. All other cards are worth the value printed on the card. The players will then add up the value of the cards left in their hand. These cards are worth negative points equal to the number on the card. Reserved meal cards are worth negative points equal to double the value on the card. This value is subtracted from the points they earned this round. These are the cards left in one of the player’s hands at the end of the game. 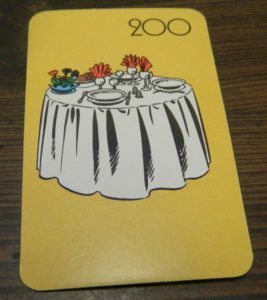 The player will lose 200 points for the left card since it is a reserved card. They will lose 600 points for the second card. They won’t lose any points for the last two cards. The players will add up the points they earned in both rounds. The player who has scored the most points wins. Players can choose to add these variant rules to the game if they want. You can only enter and exit the center of the board through the stairways. The players can choose not to use the points earned in the first phase for their point totals at the end of the game. Before playing Restaurant I was cautiously optimistic about the game. Even being recommended for a Spiel Des Jahres is a pretty big honor that many good board games have never received. The Spiel Des Jahres doesn’t reward mediocrity so I knew there had to be something that the voters saw in Restaurant to give it a recommendation. I was leery though because the Spiel Des Jahres in the 1980s is not what it is today. Today basically every game nominated for a Spiel Des Jahres is a great game. This was not always the case in the 1980s as there were a lot of games that were nominated that would have no chance if they were released today. This is mostly due to the fact that the board game industry has come a long way in the last 30 years. After playing Restaurant I would say that it has some interesting ideas and is a unique experience that is occasionally fun. Unfortunately it hasn’t aged particularly well in some areas. Restaurant is played in two different phases and that is quite fitting as it feels like you are playing two different games. The first phase of Restaurant is not very good. Basically players take turns taking cards from the game board and placing one of their pieces to mark the space. Players must take a card from a space next to the space that the previous player took a card from. Outside of cheating, there is very little strategy to this phase of the game. As you have no idea what card is on each space, you have to randomly guess which card you should take. There is basically no strategy to the first phase as you just have to get lucky and hope you take the right cards. There really are only two possible strategic decisions you can make in the first phase. First you probably want to spread out your pieces as much as possible around the board. This is a good idea as it will give you more flexibility for the second phase. The other thing you have to consider is whether you want the round to continue or if you want to end it. Towards the middle of the phase you can usually make a move that will either extend or end the phase. If you think you have acquired the most points, you probably want to end the round as quickly as possible. To end the round you just take a card that will lead the players towards a dead end. The first phase of the game is entirely driven by being lucky and drawing the best cards. All of the cards in the game were not created equally. Double stroke and jump cards might not score you any points but they let you draw another card. This gives you more cards to choose from while also giving you more options in the second phase. The meal cards can vary quite a bit in their value. Outside of maybe the 600 point dishes, there is no benefit to drawing a lower valued meal card. Dish of the day cards can give you an opportunity to steal a valuable card from another player. 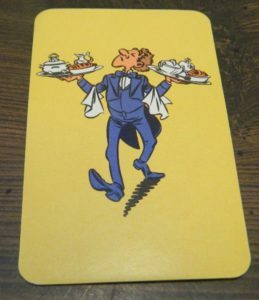 You will usually just exchange the dish of the day card for another dish of the day card as there are a lot of them in the deck. The most powerful cards may be the reserved meal cards though as they protect all of the other meal cards that you already collected. Your score for the first phase relies solely on how lucky you were while drawing. Most of the strategy in the second phase of the game comes from trying to direct the movement towards your own spaces. You want to play cards on your own spaces during your turn, while also making it more likely that you could play on one of your spaces on your next turn. If you have 600 point cards, you also want to move towards the center so you can get rid of them. Basically your goal is to get rid of as many of your meal cards as possible since it helps you in two ways. You will avoid losing the points from keeping the card in your hand. You will also score points for the card for a second time by playing it to one of your spaces. This is one of the biggest problems with the first phase relying so heavily on luck. Drawing good cards in the first phase doesn’t just help you score in the first phase. Each valuable card you get in the first phase can then be used in the second phase to score you even more points. Outside of the reserved cards which you need to get rid of as soon as possible, there is really no negative to drawing high value cards in the first phase. If you are unable to play a valuable card in the second phase, you just lose the points you earned in the first phase. You are no worse off than the other players. If you are able to play it though, you can double dip on that success in the second phase. If you don’t score many points in the first round, you can’t score many points in the second phase unless players randomly place valuable cards on your spaces. A player who does poorly in the first phase (due to no fault of their own) has little chance of winning the game. The only way they could possibly win is if they mess with the other players in the second phase. The basic strategy in the second phase is to play your valuable cards on your spaces and then end the round as quickly as possible. Once you have either gotten rid of all or most of your point cards or you think you are winning the game, you should try to end the game as quickly as possible. You need to try and steer the movement down a dead end so players have no chance of extending the game. Using a double stroke or jump card really helps in this area. If there is a player dedicated to ending the game quickly, the second phase can be quite short. In the first phase we ended up taking close to three fourths of the cards from the board. In the second phase we didn’t even play cards to half of the tables we served in the first phase. This lead to a lot of people actually losing points in the second phase. It feels kind of unfair that a round can end so quickly as a player who has no chance of winning the game could basically become kingmaker by deciding to end the phase early. One of the things that initially drew me to Restaurant was the theme. I have always thought that the restaurant theme could make for a good board game. In some ways the gameplay plays off the theme, but the theme is pretty thin for the most part. You could have easily applied quite a few different themes to the game and it wouldn’t have really impacted the game. This is a shame as there have actually been some good board games that have utilized the restaurant theme. We took a look at Pressure Cooker a while back, and Cafe International was another restaurant themed game released two years after Restaurant that ended up winning the Spiel Des Jahres. For the most part the components are pretty generic. The game pieces are just simple plastic pieces. Despite the game being released in 1987, they could have put a little more effort into the playing pieces. The game’s artwork is decent but is kind of bland. The card and gameboard quality is pretty average. The components aren’t terrible. They basically serve their purpose but don’t do much else. While I have spent a lot of time complaining about Restaurant’s issues, I don’t think it is a terrible game. For a game released back in 1987, I have to give the game some credit. There weren’t a lot of creative board games released back in the 1980s. For its time Restaurant was quite creative. As a matter of fact I have played over 700 different board games and I have not played one quite like Restaurant. I am guessing there are other games with mechanics similar to Restaurant, but I have yet to play them. The game has some really interesting mechanics that could have made for a good game. It feels like the game was a little before its time, and could have benefited from some of the ideas introduced in more modern board games. The problem with Restaurant is that the game is past its prime. For its time I am guessing the game was quite innovative. The problem is that the game hasn’t aged particularly well. 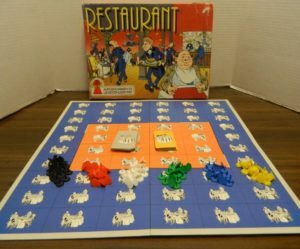 Restaurant was considered one of the best board games from 1987. Today there are probably at least a hundred board games released every year that are better than it. The game relies on way too much luck. It just feels like something is missing from the game. Restaurant is a good example of how far the board game industry has come in the last 30 years. Restaurant was an innovative game in its time, but it has now been surpassed by a lot of games. You can still have some fun with the game, but there are better games out there with similar mechanics. 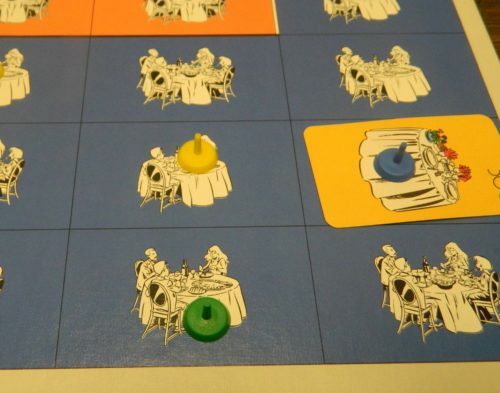 While I didn’t think Restaurant was going to be a great game, I had some expectations due to the game having an interesting theme and being one of the Spiel Des Jahres recommended games from 1987. I didn’t hate Restaurant but it didn’t live up to my expectations. The main problem with the game is that it relies on way too much luck. The first phase relies entirely on luck. If you have bad luck in the first phase, you basically have no chance in the second phase either. This is a shame because I actually think Restaurant has some interesting ideas especially for 1987. I had some fun with the game and I could see its potential. There is a good framework for a game if some rules were tweaked to reduce some of the luck. Unfortunately Restaurant is a game that has not aged well. I would probably recommend that most people pass on Restaurant as there are a lot of modern board games that are considerably better. If you think the theme and mechanics are interesting, there might be something to salvage from the game. You will probably have to come up with some house rules to fix some of the game’s problems though. If you can find the game for cheap, it might be worth picking up Restaurant. Has some interesting mechanics for a game released back in 1987. Is a unique experience unlike anything that I have played. Relies on way too much luck. Feels a little outdated compared to modern board games.